I am trying to characterize this nmos on Xyce simulator (and trying to change its present Vthreshold) and am first DC sweeping the gate and measuring the current through the nmos. I run into this strange issue where even if I sweep Vg from 0-1.8V and wire drain/source interchangeably, I find the same current going through the nmos. And it has an unusually high resistance. Two questions, am I doing wrong with this NMOS? 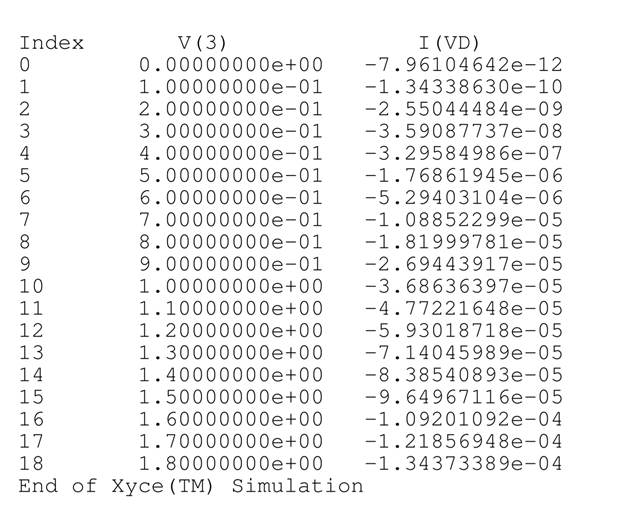 AND, I am using this SPICE 180nm BSIM3 model and cannot find how to change Vthreshold on it. With these models is that generally something one can do? I have tried setting the substrate node to ground in this circuit but still get symmetrical source-drain current behavior. In a real, physical NMOS transistor fabricated using a planar technology the source and drain terminals are in fact interchangeable. The "source" is therefore the terminal at the lower voltage and the "drain" is at the higher voltage. However, you do want to connect the body to the lowest voltage in the circuit to prevent forward biasing the body/source junction. You generally cannot change the threshold voltage directly in a BSIM3 model. These models are very complex and with a great deal of interaction between the model parameters. As @Elliot said, the transistor (because it is symmetrical) does not know which terminal is the drain and which is the source, it is only a matter of potentials. am I doing wrong with this NMOS? Not really, results show as expected. Threshold voltage can only be changed by changing its bulk voltage (see body effect). Not the answer you're looking for? Browse other questions tagged simulation spice nmos or ask your own question.